Thought someone here might care about this Ebay listing. 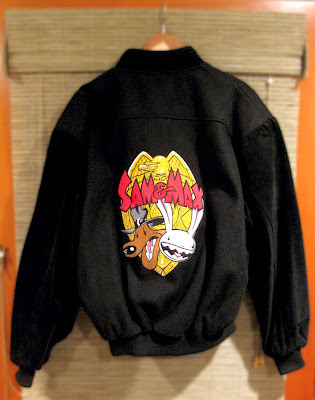 It's a crew jacket from the Sam & Max animated series. Not mine but was my wife's who I don't think ever wore it >snif<. Size Large. UPDATE: The jacket is on its way to a good home in southern California. Thanks for playing! Shameless promotion indeed. :) I saw one of these on ebay before... too bad Berkeley weather's really hot in the fall. I want to own it! Oh my god, +200$... I'll never be able to paid this. Oh, how could she sell it??! I still proudly wear mine whenever the weather gets cold enough.